The Loot Box Problem and Why Rocket League Should Be Rated "Adults Only"
A “loot box” in video game terminology is a randomized chance at receiving one or more virtual items in a video game (often by opening a virtual “box” of some sort). My first encounter with a loot box system was in Mass Effect 3. While playing Mass Effect 3's multiplayer mode way back in 2012, I would regularly open loot boxes (called “packs” in Mass Effect 3) which I had obtained with in-game credits I had earned from completing multiplayer matches. The option to skip the grinding and buy packs with real money was available, but I never felt compelled to do it that way because it was pretty easy to earn them through normal gameplay. Even playing on Bronze — the easiest multiplayer difficulty — could get you a Premium Spectre Pack (the loot box with the best chance of giving you the most desirable items) after maybe two to two and a half hours of gameplay. That may seem like a lot of time at first glance, but I know from experience that hundreds of hours can be sunk into great multiplayer experiences. And playing on Silver difficulty — just one step up — could get you a Premium Spectre Pack in about one hour. I eventually got every available item in Mass Effect 3's multiplayer without ever paying real money for one of the game’s item packs. Years later, I discovered a massively fun multiplayer game called Rocket League (a game in which you play a form of virtual soccer, hockey, etc. with rocket-powered cars). The thrill of making that perfect goal or managing to pull off an amazing save made it a blast to play. By the time I stopped playing Rocket League, I had sunk 462 hours into the Steam version and even more hours into the Xbox One version (yes, I bought it twice). I even joined an official Rocket Hockey League team for a short time (because I loved me some Snow Day). On September 8, 2016, something started to go very wrong with Rocket League. 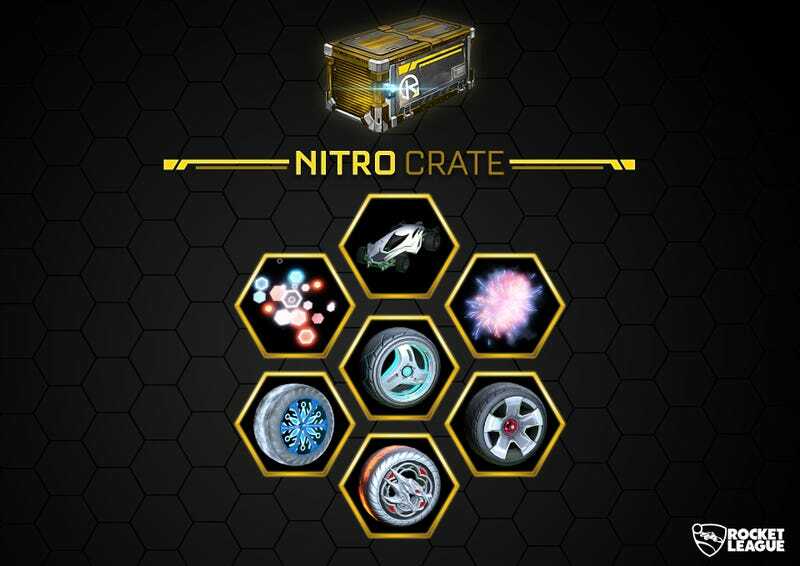 Loot boxes (called “crates” in Rocket League) were introduced. Occasionally after completing a match, you would be rewarded with a crate. These crates contain a random chance for you to get one of several items available in that crate. But unlike with Mass Effect 3's packs, the randomized content in Rocket League’s crates could only be unlocked with “keys” — and those keys had to be purchased with real money. I’ve never been into gambling. I don’t like casinos. I don’t even buy lottery tickets. But Rocket League’s crates got me. There was a thrill associated with opening those crates — a thrill which I would later learn is the same kind of thrill someone experiences as they pull down the lever on a slot machine. The reward center of my brain had kept me coming back for more and more pulls on Rocket League’s virtual slot machine. This excellent video from Matthew Patrick (the Game Theory guy on YouTube) gets into the science of gambling addiction and how it applies to loot boxes. I would now like to try to address a few pro-loot box arguments I’ve heard. 1. They’re optional. You don’t have to buy them. Yes, this is true. It’s also true that a person doesn’t have to spend what should be food money on lottery tickets, and that a person doesn’t have to empty their wallet trying to win something at a slot machine. Like the above video talks about, gambling mechanics — whether in the real world or a virtual world — can be very addictive. You may as well say that a nicotine addict doesn’t have to light up. 2. Loot boxes are not really gambling. This is where legal definitions probably need to be changed. The argument that loot boxes are not really gambling stems from laws that define gambling as a game of chance in which you try to win something but can (and usually do) walk away with nothing. Since loot boxes always give players something (even if it’s something they don’t want), they don’t currently meet legal definitions of gambling. But let’s apply the “loot boxes are not really gambling” logic to casinos. Let’s say that the management at a casino decided to always offer their customers something in return for playing — whether it’s a penny at a slot machine or perhaps one low level chip at a craps table. Since it would be impossible for a customer to walk away with nothing, would that casino no longer be a gambling establishment? I would argue that it would still be a gambling establishment — just with slightly different mechanics. The addictive and financially draining elements are still there. Throwing your customers a small bone doesn’t change that. So yes, I absolutely think that gambling laws need to be changed to include loot box mechanics. 4. Pay-to-win loot boxes are problematic, but cosmetic loot boxes are fine. This is the distinction that Rocket League developer Psyonix has made. Since Rocket League’s crates contain purely cosmetic items, everything’s good... right? Well, let’s examine that. First, I question the assertion that all of Rocket League’s crate items are purely cosmetic since some of those items are crate-exclusive vehicles. Let’s say that someone obtains a crate-exclusive vehicle when they open a crate and that things about that vehicle (acceleration, handling, hit box, etc.) mesh so well with their play style that they end up winning a higher percentage of matches with it. Would that not fall under “pay-to-win”? But let’s say that it doesn’t fall under pay-to-win and that all of Rocket League’s crate items are purely cosmetic. Cosmetic loot boxes employ the same addictive gambling-like mechanics as pay-to-win loot boxes. In that respect, there’s no difference between the two. So in my opinion, making your loot boxes cosmetic-only does not make them okay. I should note a couple of things about Rocket League’s crates. The first one is that a portion of the proceeds from key purchases goes into the prize money pool for Rocket League competitions. So not all of the money from crates goes straight to the developers. The second thing I want to mention is that, once in a while, there are events which allow players to earn a limited number of keys to open crates (three in my experience) from normal gameplay. Unfortunately, these special keys (called “decryptors”) make it so that the items you get from the crates they open cannot be traded with other players. So if you got an item you didn’t want from using a decryptor key, you’re stuck with it unless you’re able to combine it with other items in its class and trade them in to the game itself to get a new item that’s one level higher. And even then, your new item will also not be player tradable. It would be nice if players were able to earn unlimited decryptor keys (or even normal keys) through normal gameplay at all times, but that’s probably too much to hope for. So why have I been harping on Rocket League for this entire post? Why haven’t I talked at all about Star Wars: Battlefront II and Destiny 2? Part of it is due to my experience with Rocket League’s crate system and lack of experience with the loot box systems in those other games. But I also don’t want games like Rocket League to get an undeserved pass when it comes to the loot box controversy. In my opinion, any game that has an addictive gambling-like loot box system in which loot boxes can be purchased with real money (or purchased with in-game currency that can be purchased with real money) needs to be called out. Going back to Mass Effect 3's multiplayer mode, I don’t like the fact that purchasing packs with real money was even an option. Even though I loved Mass Effect 3, I would be remiss if I didn’t call it out for that. In my opinion, any game that employs gambling-like loot box mechanics in exchange for real money should be rated “Adults Only” by the ESRB — including Rocket League. The ESRB already includes gambling with real money in their list of things that can cause a game to be slapped with an “Adults Only” rating. Loot box systems in games like Rocket League are practically if not legally gambling, and they should be treated as such.